The unstoppable T-FORCE gaming product series has gained global consumers’ interest in gaming ever since its release. 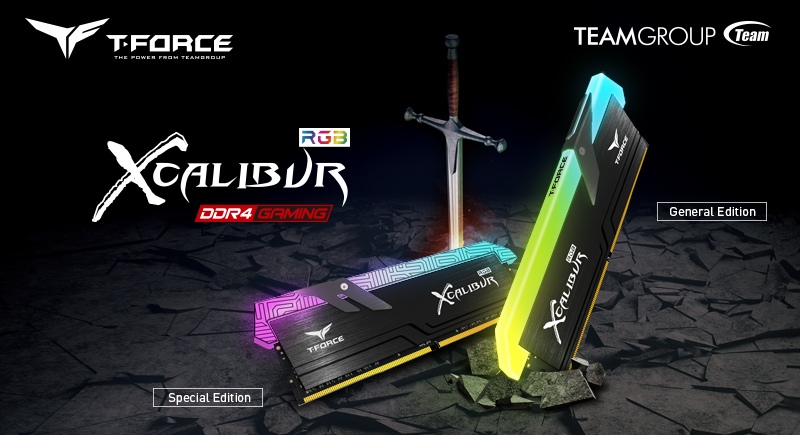 In 2018, once again, T-FORCE releases the all new luminous memory module – T-FORCE XCALIBUR. TEAMGROUP design team continues the design concept of the ultra-wide-angle force flow effect, using the full color and dazzling RGB LED lighting with the full range, 120° ultra-wide angle luminous area at the top that emits colorful bright light. Moreover, they add unique totem element on the light guide for special edition with innovative ideas. The initial letters of T-FORCE, TF are designed as hilts of the king’s sword on the heat spreader to bring an extraordinary visual experience to the gamers. The two ultra-high frequencies, DDR4 3600MHz and DDR4 4000MHz support the total capacity of 16GB(2x8GB) . With selected Samsung IC chips and strict testing standard, it offers excellent quality, optimal performance, stability and compatibility. It allows gamer to win every battle as if he/she is holding the king’s sword in the gaming world, and also setting a new benchmark for RGB luminous memory modules. As powerful and dazzling as a king’s sword, the T-FORCE XCALIBUR has a full color synchronized changeable lighting effect. 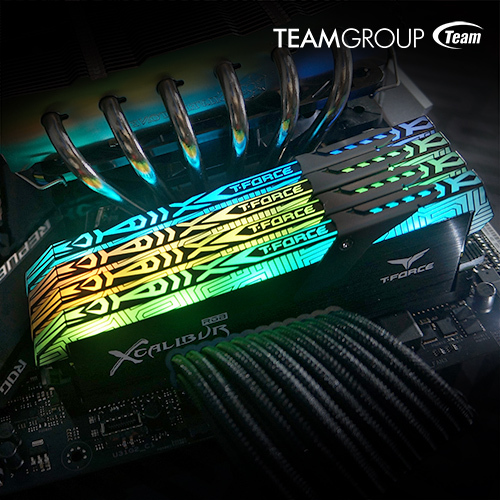 The lighting can be controlled and synchronized through TEAMGROUP’s exclusively developed T-FORCE BLITZ(Beta version)(Note 1) or ASUS Aura Sync(Note 2). After synchronization, there are up to 8 types of built in lighting effects available. In addition, RGB memory module’s lighting effects and partial system’s synchronized lighting effects can be controlled through GIGABYTE’s RGB Fusion(Note 3) / MSI’s Mystic Light Sync(Note 4) / ASRock's Polychrome Sync(Note 5) software. Moreover, users can change the setting manually according to personal preferences for displaying an eye catching visual effect with personal style. 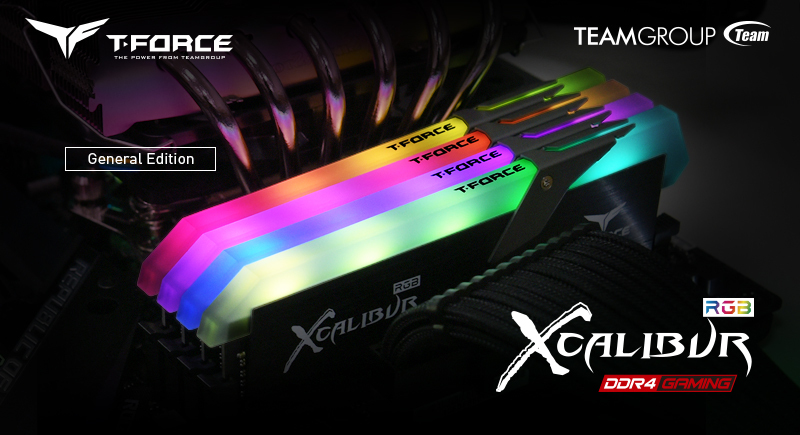 T-FORCE XCALIBUR supports Intel XMP2.0 technology, therefore there’s no need to adjust the BIOS separately. One click overclocking technology offers gamers the high-speed sensation and the winning pleasure of invincibility. : T-FORCE BLITZ (beta version) may be downloaded from the TEAMGROUP website or T-FORCE XCALIBUR webpage. : T-FORCE XCALIBUR supports Asus AURA Sync which can control the lighting effect and achieve complete synchronization of lighting effects. 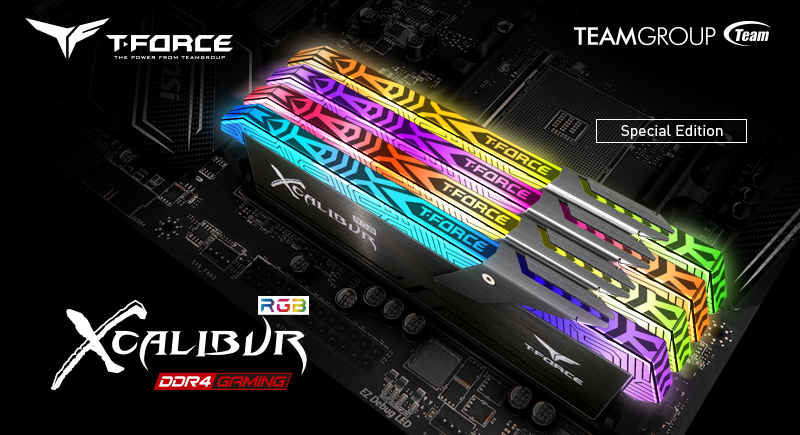 [3/4/5]: T-FORCE XCALIBUR is compatible with GIGABYTE RGB FUSION /MSI Mystic Light Sync/ ASRock's Polychrome Sync and some system lighting synchronization effects, but the system lighting synchronization functions with RGB FUSION will only be possible once GIGABYTE/ MSI/ ASRock updates its software.